Supplementary material reads: "From News Bureau, Pan American. Foto [sic] caption. Raw Negs... Pls. develop. Miss Indonesia arrives via Pan Am jet for Long Beach International Beauty congress. From far-off Djakarta, capitol of Indonesia cometh beauteous Iana Sulastini, 'Miss Indonesia' who will compete with national and international pulchritude in the Long Beach 'International Beauty congress.' 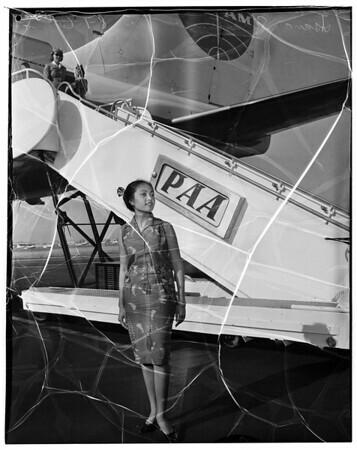 Miss Indonesia was accompanied on the long Pan Am jet clipper flight from Djakarta via Hongkong [sic] and Tokyo by her chaperone Mr. Sanjoto Djatiasmoro."